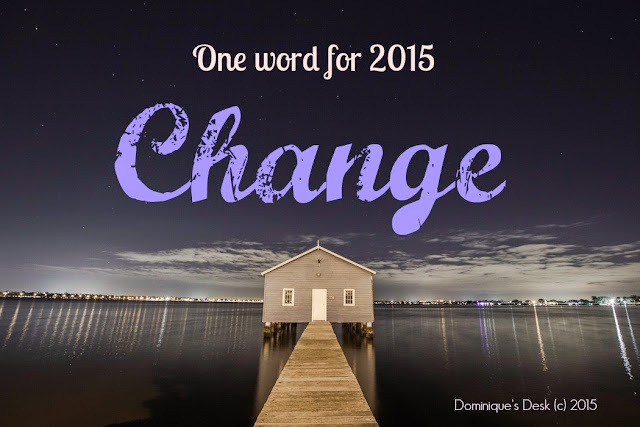 2015 is the year of CHANGE for me. I’m dedicating this year to doing a massive overhaul in the different areas of my life. I have been procrastinating for too long and it is time for some action. It is time for a revamp- Physically, Mentally and Spiritually. I’m going all out to make it work this time by systematically following through my to-do list for each area that I will be working on. – Get the kids/ family to participate in more outdoor and physical sports. – Sleep earlier each day and try to get better quality sleep with the help of essential oils. – De -cluttering every area of the house to reduce physical clutter and only to keep items that are really of use to the family. – To remove all toxicity around me be it in the form of a person or thought. Reduce negative thoughts, actions and presumptions. Those are great changes! I love the idea of shedding old habits to adopt new ones. The best of 2015 to you! A new year is a good time to make changes. Your goals resonate closely to my resolutions for 2015. Here’s hoping that change is successful for us both! Cultivating an attitude of gratitude will be just the thing to keep you on track to reach this year’s goals. Good luck! Good word! Good luck on all your changes! What a great word! I love how you divided it up into categories as well. I did something somewhat similar with my word of the year. I love all of those, many are similar to mine (especially in the physical/spiritual areas). Best of luck to you! Good for you. You’ve put a lot of thought into those changes and I wish you all the best for 2015. Nice plans! I hope you (and me, too!) will be able to achieve what we plan to do this year! Good luck to us! Happy new year, Dominique! Better is my word for 2015. I am a better me in 2015 and I am praying that all my goals will be achieved. Have a Blessed New Year to you and your family. Nice photo, fine, I wish 2015 a change as your desires! I think my word is going to be nuture. I want to concentrate on nuturing my family and myself. HOPE is my word for the year! I am hopeful that everything will fall into the right places. Great resolutions….I’m giving up soda pop for the year. Happy 2015 still! I usually resist change, but you’re right…it can definitely be a good and healthy thing! Change is always my favourite word because it is the opposite of bored!!! Good luck with your massive overhaul on your life – you have a fantastic list for 2015, we will look forward to seeing how you go through your posts. Wishing you a fantastic year ahead.